The youth market segment will become the most important for manufacturers during the upcoming years, first models targeted for this segment will be released during this summer. Unlike the phones released for youth earlier, these will be completely different, from now on they will contain functions that were typical for business segment products. The manufacturers decided to drop such solutions as exchangeable covers, vivid colors. Indication of today’s phone targeted for youth market is not defiant outlook, but staunch design and functionality close to maximal rate. This weird change among manufacturers is caused by the fact that youth have broken all predictions by marketing agencies, they were buying business solutions, and sometimes even saved models which failed to be popular in originally aimed segment. It’s exactly young people who like doing experiments, they are attracted by new technologies, meanwhile middle-aged people are mostly conservative. The release of new generation phones for youth was predetermined, they must feature strict design with elements of some sort of freewill, the functions must be close to maximum, plus software must be less strict and respond to segment’s demand. 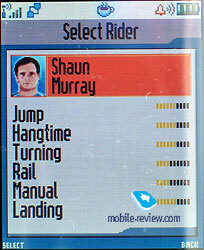 The model Motorola E398's development process was guided by these rules. The phone’s design is performed in calm manner, it is not screaming. The edges were slightly rounded, this creates good impression from overall phone’s shape. The plastic which is similar to rubber by tactile impressions is used for the construction (back cover of T68m was similar)… It is pleasant to hold the phone in one’s palm, it does not slip out even if your hands are wet. Another advantage of such plastic is that it is not mat, it does not leave marks. In order to underline the difference of plastic, keyboard was made of simple material. The buttons are big and are located in terrace shape, the work with them is comfortable. I cannot say that the keyboard is ideal, but it cannot be called bad either. The fact that vertical button line is slightly raised and side rows are slightly drowned is a good solution, you can dial the phone number with your eyes closed, no mistakes will be made. 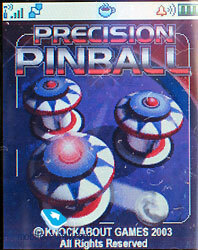 The joystick is glossy, its size is average. The opinions of users who had been using this phone were different, ones were saying that it slips, others found it convenient. During some time everyone got used to it. I should also point out that there were no accident moves due to imprecise joystick positioning right from the first minutes. In my opinion the only mistake that can occur during its usage is that the user who is trying to manipulate it uses only tip of his thumb, it is better to push joystick with the whole finger. 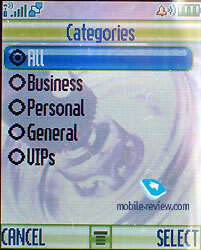 The menu navigation is possible by using only joystick, this means that soft-key usage is almost not required. You should also remember that the phone has shortcuts feature as well, it is not related to joystick, the user can define the way he likes working. 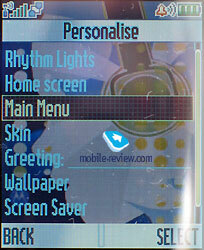 Let’s move on to the phone’s display, it is identical to the one used in Motorola v300, v500, v600. I.e. 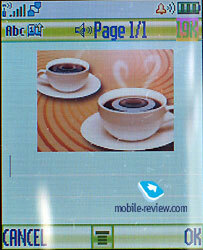 the screen’s resolution is 176x220 pixels, it can display up to 8 text lines and two service lines as well as icon line. The physical screen’s size is 30x38 mm, this is slightly more than Motorola v500, v600. The explanation is hidden in the fact that this model’s protection mirror is a bit curved. That’s why we get slightly bigger size of displayed area. The display is made by TFT-technology (65k colors), it becomes pale on the sun, but remains one of the best displays by behavior during summer sun factor. 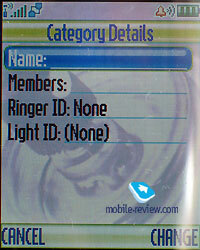 This means that comparing to other phones part of information remains readable. On the whole the quality of information displaying is extremely comfortable, the colors are lively and saturated. 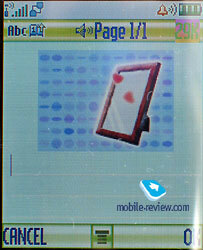 In this segment the screen’s quality is the best (it can be compared only with Sony Ericsson K700). I`d say that competitors from Siemens and Nokia are losing the quality battle rather hard. 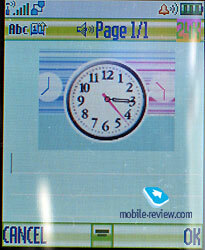 The screens that can be compared with Motorola E398 are located only in new Samsung phones, which are targeted differently. Let’s get back to the phone’s construction, its sizes are 108x46x21 mm. The phone is visually bigger than its real size, if you put it together with the very same Sony Ericsson T630, you will not see big difference. 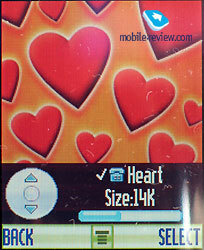 The phone’s weight is 107 grams (the manufacturer states that it is 110 grams). You can see the speaker holes on the phone’s sides. The diameter of each is 16mm, together they produce surround sound. The phone Motorola E398 de-facto becomes the first phone with stereo speakers on the market. Even though such models were demonstrated long time ago by Korean manufacturers, this is the only model where this function is already developed and will be released on market first. A lot of people can say that stereo sound on handset is nothing more than fun, and it is required only to few people out of 10 000. Such statements are common for those who are not related to the targeted segment, such people are not young. What are the two speakers benefits? The first and most obvious – volume of ring tones (usual ones and mp3). 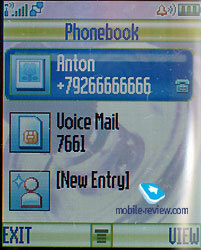 Comparing to Motorola v600 the ring tone sounds twice as louder. To be more precise: it is almost twice as louder, the sound’s volume increase is not linear. Setup of two side speakers allowed creating volume of main speaker which is used during the conversation slightly lower, in my opinion this was not required. In noisy locations the phone is often heard worse than Motorola v300, v500, v600. Nobody is perfect, and if those models that were almost not heard and as a result you were ending up with missed calls, here the ring tone is heard, but the person you are talking to is heard worse. I’d like to point out that the volume of main speaker is lower than other companies phones (vX00), the difference with phones from other manufacturers will not be noticeable. LEDs are built in inside bars of side speakers, they can change their color depending on the chosen color scheme. This means that whenever there is an incoming call the phone notices you not only by sound, but by color alert as well. 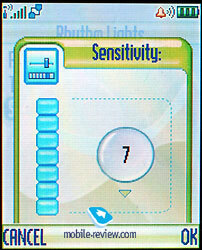 This technology is called Rhythm and Light, other title is Haptics. 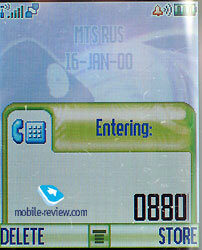 The first model where this technology was introduced is Motorola v80, here everything is the same. Curious fact that both phones will be released on the market in approximately even terms. You can also enable special mode of color-o-music for discos, just setup the mic’s sensitivity and time of function’s work, choose your favorite color scheme and the phone which is located on your chest will start changing its colors in tact to music. In reality the activation of this mode takes only few seconds. The backlight is situated not only on the phone’s sides, but on keyboard as well (only one color – white). This function is ideal for targeted consumers. At the moment none of manufacturers has alternative to this function. Port for stereo-headset is located on the top edge, it is covered with rubber cork, which is attached to the case. The advantage of such solution is that it does not use standard interface connector, which is located on the bottom side of the phone, although you can connect the headset there as well. But in that case the construction will turn out being rather big, and this is not a good thing at all. 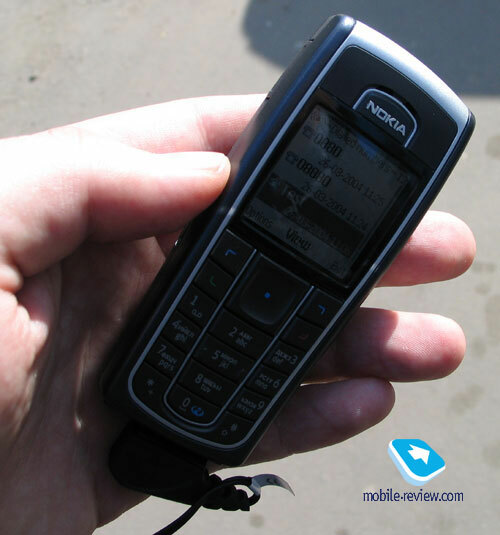 The typical example of wrong solution is Nokia 6230, the phones size with connected headset increases by almost one centimeter, this cannot be called optimal. The phone is compatible with all standard accessories from Motorola, this is a result of standard interface connector and the very same triplet platform. You can see two volume control buttons on the left, meanwhile Smart button is located right under them. 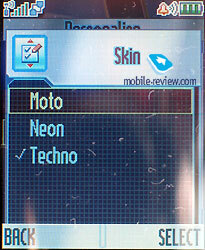 We have seen it in the older models from Motorola, later on this one was excluded and not it is back again. The advantage of this button is that you can bind almost any feature to it, this is convenient. The access to selected feature is possible during stand by modes, and certain functions during the conversation (this depends from firmware version). For example, if you bind dictating machine function to this button, you will activate it with one key-press during the conversation. But if you will bind voice dial function, pressing the button during conversation will not affect anything. Considering the rich possibilities of setting up the phone via software, we can say that the phone offers almost all ways of working with it, you just have to choose the most convenient for you. The soft-key dedicated to camera is located on the right side. 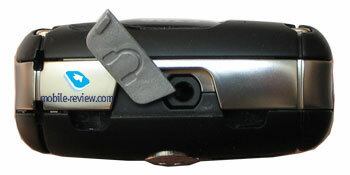 The camera is located on the back side, it is a common VGA camera. 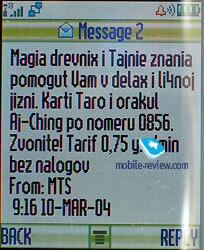 The improvements are noticed only in the fact that the phone received flash (yellow window on the back). The flash will help only in bad lighting conditions, in other cases it is not required, this is more of a marketing function than real functional improvement (just like other manufacturers do). I will not tell you about the camera in details, all settings are equal to triplets, the photo quality is equal. After opening the back cover – you will see the battery. The cover does not have backlash, it is nicely located in its nest. The phone uses Li-Ion battery with 700mAh capacity, the manufacturer claims that the phone can work up to 210 hours in stand by mode and up to 7 hours during conversations. 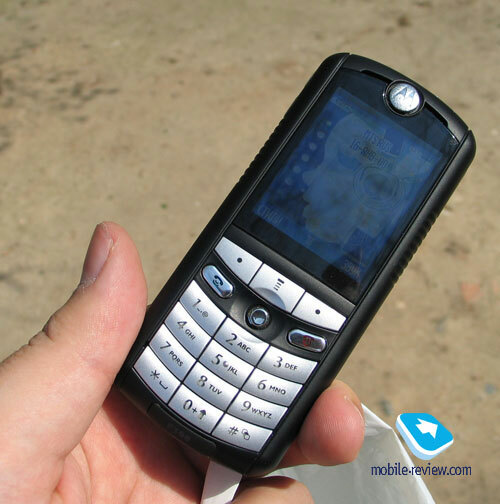 While we were testing this mobile phone it worked for 2 days with 2.5 hours of listening to mp3 files, 45 minutes spent for talks and up to 40 minutes spent for playing Java games. During all this time Bluetooth was activated. More modest requirements show that the phone can work for about 3 days. The energy consuming depends on the screen’s working time, amount of games (sound) and incoming calls. It takes about 2 hours for the phone to charge up completely. The first few chargers last longer, this is normal situation. In our case during four charges it took the phone about 5-6 hours to charge up. Considering the amount of used functions, we can say that this model’s working time can be compared with its competitors. 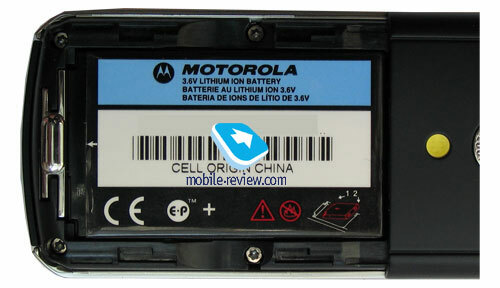 The SIM-card holder is located under the battery (it is standard), and T-Flash slot is located near it. 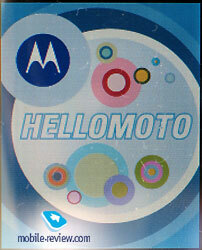 These cards are introduced first in Motorola E398, in future they will be used in many of company’s phones. I have to tell you about T-Flash standard, which was developed by SunDisk, and why it was released. 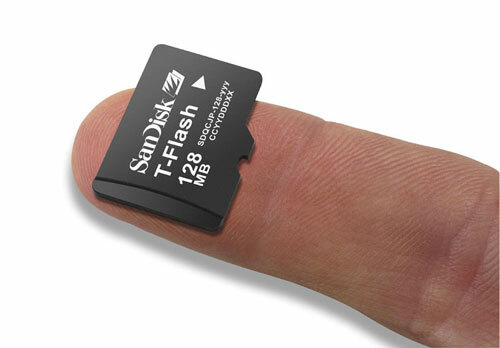 The appearance of TransFlash memory cards is caused by the requirement of using small memory cards in mobile devices. The existing card standards during the development process were not satisfying the miniature condition. The second task which SunDisk was trying to solve is creating storage device for phone’s software code, possible settings etc. 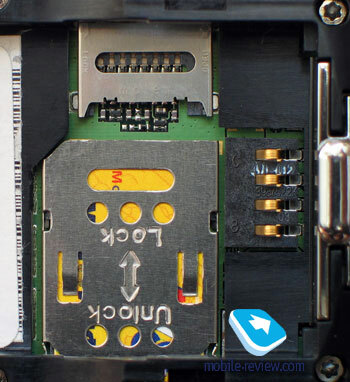 Such usage of TransFlash cards caused the fact that they can be “hotswapped”, as well as implied near the SIM-card slot (can be changed only after the phone is turned off). The second way will be used in first phones, cards can be replaced only after the device is turned off. 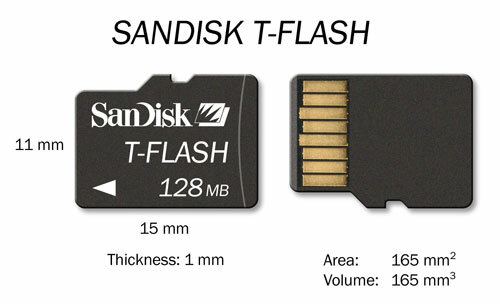 TransFlash cards are compatible with SD-cards as well, they can be read in corresponding adapters. TransFlash cards size is 2/3 of SIM-cards size (15x11x1 mm). These are the smallest memory cards on the market. The manufacturer claims that at the moment only cards from 16 to 128mb will be released. In reality by the end of year 2004 cards with up to 1gb capacity will be released. The price of cards with 32mb capacity will be 14 dollars, and up to 39 dollars for 128mb. Considering the fact that these cards are going to become mass, we can expect price drops especially after big number of devices which are using them will be released. Technologically the cards are built on NAND MLC platform, memory from SunDisk, same memory is used in miniSD cards from the same company. 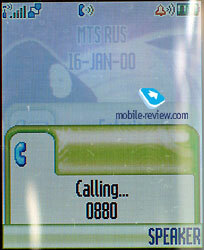 The first mobile phone manufacturer who had announced mass support of TransFlash cards in its products was Motorola. Siemens is expected to join the party as well, they are planning to use this type of memory in Siemens SL65. The main competitor for TransFlash memory card are RC-MMC cards (reduced size MMC). These are the common MMC cards, that have twice as lower physical size. 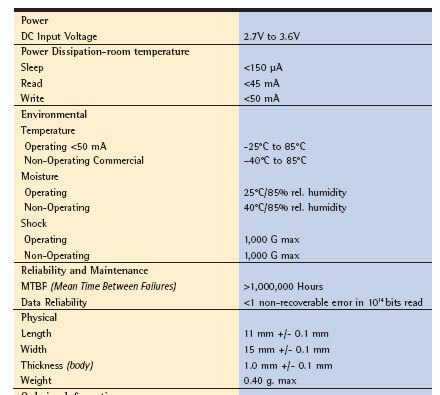 There are no clear advantages comparing to TransFlash, they will exist parallel. In my opinion depending on the success of this or that mobile phone manufacturer with products that are using this or that memory type the amount of standard’s success will be measured. 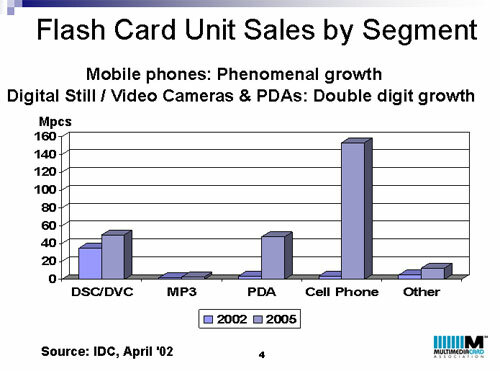 Here is an illustration of prediction for sale’s growth, memory cards for various devices,as you can see the main source of sales will be cellular phones. The phone has 64mb card pre-installed, this allows recording about 1hr of music in high quality, or up to two in worse quality. You can also record any type of files on the memory card, and use it as storage card. The files with illegal extensions are not displayed by the phone’s file explorer, but they are visible with sync software. On the whole storage card is playing the role of music storage, and extension of phone’s internal memory as well. For example the phone is addressing all memory in same way, you just have to choose the source (alike hdds in PC). The difference in where the files are located (on storage card or internal phone’s memory) does not exist. For example in case if you do not need mp3 files, you can occupy whole memory card with wallpapers, games and ring tones. USB-cable for synchronization with PC is included, as well as full version of Mobile Phone Tools software. The presence of cable is caused by the fact that not all users have Bluetooth on their PCs. 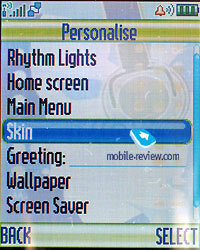 You can also find about 100mb of various pictures, ring tones and additional games on CD. The whole content was developed in partnership with MTV, this is a part of global contract of Motorla and MTV. The data transfer speed for memory card is rather high, it takes about 7 minutes to fill it completely. 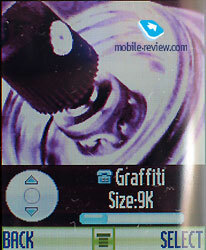 We will not describe all functions of Motorola E398, they are nicely described in Motorola v300, v500, v600 review. This model is related to the same class, typical triplet. But at the same time we have some software improvements comparing to the listed models. New pleasant features and possibilities which were not present earlier are introduced. I will try to list them. 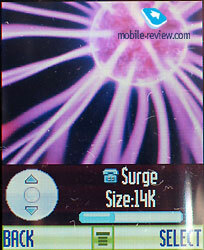 First of all, during the stand by mode when the user’s screensaver is not activated (this can be any static or animated picture) the phone is displaying battery level and network level on dark background. Unfortunately information about missed calls, events is not displayed in this type of screensaver, most likely it will be introduced later. The possibilities of Skins have been expanded as well. From now on when you are changing skins, you are free to change almost all including the icons appearance, view of analogue and digital clock. The phone’s outlook becomes easily customized, the company’s web-site promises to release new themes which can be downloaded into your phone. 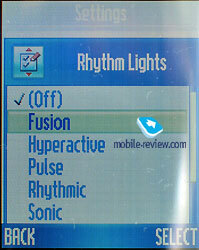 Besides assigning custom ring tone, photo to contact you can assign custom backlight color, this is additional feature. On the whole the menu where action must be confirmed the manufacturers introduced feedback. For example when you have dialed the phone on the keyboard you have to call there, right? On the whole this is a standard procedure. Here after you are pressing the Call button, you will feel light vibration and sound alert. Such things are used at maximal possibility in games. Finally internal appearance of the phone, set of preinstalled templates – this is clear comprehension of targeted consumer’s requirements. For example MMS templates – these are cute pictures that are interesting and curious. 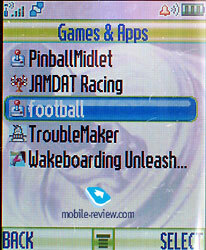 Games (all games are made on Java, the phone supports MIDP 2.0), they are different. 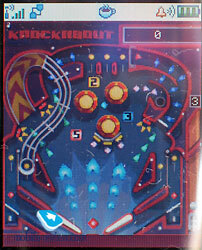 For example the phone has Pinball, which is really nicely done. I have to admit that for the second time phone from Motorola takes away a lot of my time, the first one was Monopoly at Motorola v500. 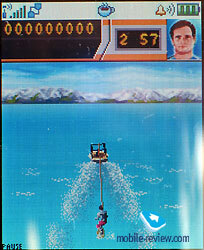 Another game is related to water skies theme, I cannot say that everyone will get fond of it. The football on the whole is not interesting, but some might find it amusing. In second game which we had the opportunity to play you had to run around the house, pickup objects and cause all kinds of problems to those who live with you, you also had to talk with them. 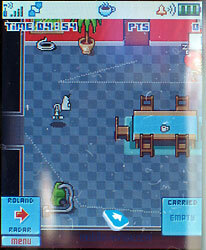 On the whole the game does not contain any destructive incline, it is funny mostly due to ludicrous characters. There is nothing besides desktop wallpapers with characters from PlaticWorld at the web-site http://www.plastikulture.com/, however we advice you to visit and before the official launch. If we rate the Motorola’s efforts in content area we can say that they are big, other manufacturers are dedicating less attention to this theme. In the end I’d like to point out that you can read about the phone’s functions HERE and HERE, they are identical to all triplets. They should not be listed again, just don’t forget to make certain corrections to phone’s content, its youth part and few new features since this phone uses other firmware version. You can read about the camera here. The network quality does not cause any problems, the phone performed nicely in various conditions. As we had mentioned above, the presence of stereo speakers makes the ring tone volume loud, it is nicely heard in various conditions. The vibrating alert power remains average, it cannot be felt all the time. The start of this model’s shipments will be in the end of July, beginning of August. The price for this phone in standard package (maximally possible) will be around 330-340 dollars. Higher prices can be expected during first week of sales, the price can remain at high level due to lack of these phones. 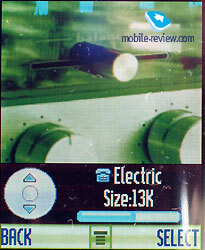 In its segment Motorla E398 has biggest amount of competitors, the direct one is Sony Ericsson K700. Both phones will be released at the same time. K700’s advantages are built-in radio, bigger amount of internal memory, presence of IrDA. At the same time E398 has exchangeable memory card support, interesting set of preinstalled games. Both phones have Bluetooth, practically maximal amount of features for today. E398 has such functions as stereo speakers, exchangeable TransFlash memory cards, light-o-music. For other manufacturers presence of this or that unique possibilities was chance for raising the price, here we do not see same tendency. Finally, lyrical off-topic. In its segment the phone is almost ideal, it suits nicely for youth’s demands. The phone impressed almost all who was using it for at least five minutes. The analogue action was made by K700, these are the two most interesting phones for young people this summer. Of course their price is bigger than budget phones, but we have different kind of young people, right? These two models will be popular in big cities. I can say one thing for sure, both models will become sale hits, it just cannot be other way. P.S. Among recent phones that were tested in our lab we have noticed sort of black-line of models with problems, not rather good specifications and clear slapdash. The thing that we have encountered few similar models that were actually really nice is a relief, you have read about one of them in this review, others will be published soon as well, including Philips 855, stay tuned!